One Water is defined by the Water Research Foundation (WRF) as an integrated planning and implementation approach to managing finite water resources for long-term resilience and reliability, meeting both community and ecosystem needs. It is the emerging term in the United States for what is commonly known as integrated urban water management. Cynthia and George Mitchell Foundation’s report Advancing One Water in Texas. 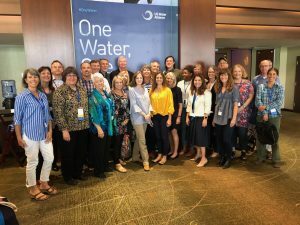 US Water Alliance’s One Water Hub including information on the annual One Water Summit. WVWA Executive Director was honored to be a part of the Austin delegation (pictured below) at the 2018 Summit. The 2019 Summit will be held in Austin.